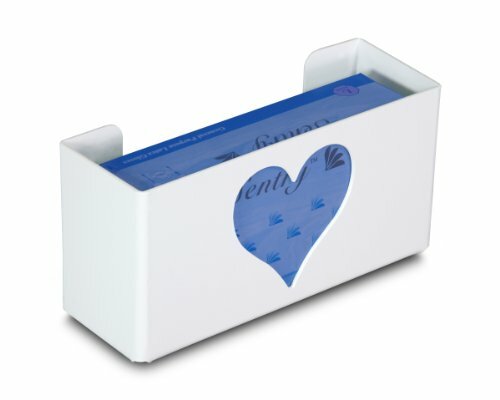 TrippNT's heart single glove box provides unique and fun glove storage. Sturdy white plastic construction. Universal fit for 1 standard size box of glove. Installs instantly with provided hardware and keyholes. Measures 11" width by 6" height by 4" depth; 1 pound weight. TrippNT manufactures storage products, dispensers, carts, workstations, and shields for scientific laboratory applications. The company, founded in 1993, is headquartered in Kansas City, MO. View More In Lab Furniture. If you have any questions about this product by TrippNT, contact us by completing and submitting the form below. If you are looking for a specif part number, please include it with your message. Brady MVSD 18" Height, 8" Width, 4" Depth, Tough Acrylic, Black And White On Clear Color Deluxe Visitor Spec Dispenser, Legend "Safety Glasses"